There was hope that the Florida Gators‘ quarterback battle would be settled before game week against the team’s toughest September nonconference contest in ages. Nope. Head coach Jim McElwain said Wednesday that he thinks “they’re all going to play” against the Michigan Wolverines, referring to graduate transfer Malik Zaire, redshirt junior Luke Del Rio and redshirt freshman Feleipe Franks. 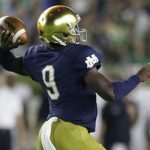 Though Franks was leading the competition out of spring practice while Del Rio was recovering from multiple surgeries and Zaire was still attempting to make his way onto the Florida roster as a transfer for Notre Dame, the three signal callers have alternated first-team reps consistently since fall practice began. Beat writers who have watched practice live believe that it will actually be Del Rio or Franks taking primary snaps for the Gators in the opener with Zaire likely factoring into the game plan in another manner. However, McElwain left all of that open ended on Wednesday. “You’re going to see a bunch of them in there playing,” McElwain said. “The three guys have done a really good job. Not naming a starter right now. I think that there’s some things that they all bring to the table that are really good. Now the key to us is putting them in those positions that play to their strengths. McElwain dismissed a question about at least pairing the competition down from three quarterbacks to two, noting that he likes the way all three are playing before making a joke about the song lyric of one being the loneliest number. While this may be some form of gamesmanship from McElwain, the fact that the quarterbacks have publicly been splitting first-team reps lends credence to believe that no one has been chosen. He also denied flatly that he is trying to play mind games with the Wolverines. 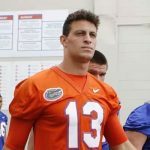 Florida quarterback battle resets: Is Malik Zaire the favorite over Feleipe Franks?